Each cane is equipped with a 15 3/8 in. stainless steel, mirror polished blade. The classic hardwood handles offer support and comfortable grips. Each blade fits securely into the solid black sheath with rubber tips. 37 in. overall. I bought this back when I needed a cane, but I wanted a sword cane for protection. Right out of the box it was simply weak hollow wood. The bottom rubber bit was about to fall off, when I had to use it for defense, the wooden handle snapped off and the connection of the sword to the cane was very loose that it came off as well. I would not recommend this item to anybody who wants a good sword cane. I wish I'd never made this purchase, if it wasn't such a hassle to return it I would have, the surface is pitted(un-impressive)the blade was the biggest disappointment, it looks more like a scewer and fell out of the handle. Bought the cane, looked good, felt good, after one week the blade dislodged from the handle. The cane is made of a soft wood and the metal blade is glued to the handle, so it falls apart. This sword is best used for display purposes. On arrival, it lasted only a couple of weeks, when the top brass grommet containing "the handle and blade, separated from the cane" and required gorilla glue to repair it. Ditto with the brass grommet "bottom cane tip." If you live in a high humidity area, these matters may be no big deal, but in Arizona with low humidity, it is. Also, the blade required sharpening. At 82, I need a cane for support, and would not depend on this cane to maintain my stability, or if I found myself in trouble. I have another weapon for that. if u dont like swords that bend dont buy this. 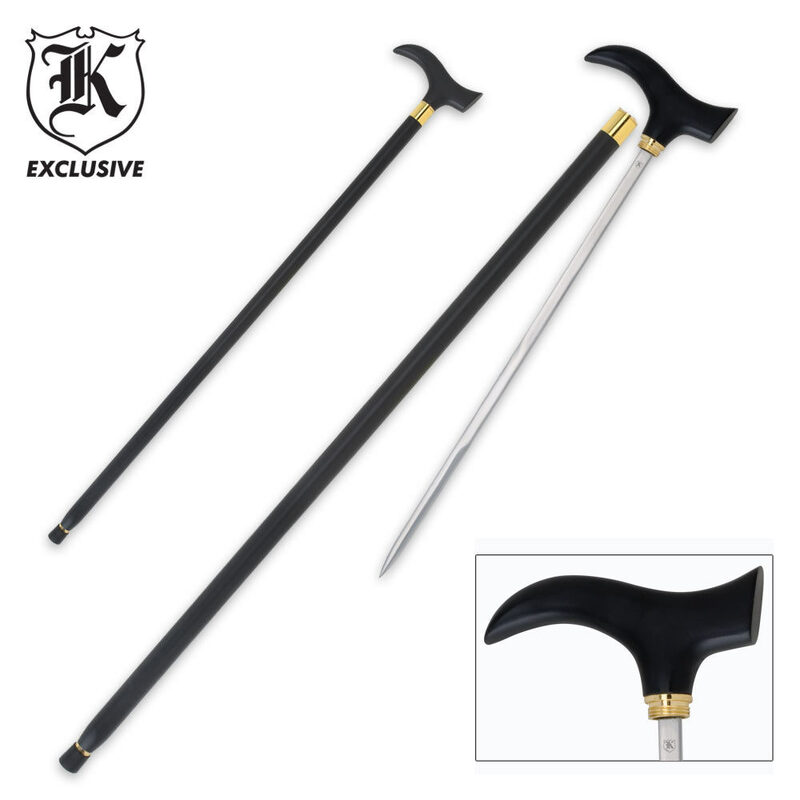 If you want a cane sword only you will know, this is it!It can be used as a gents cane, and a weapon if you need it.85% of my sword canes come needing sharpening to the way I want them.The handel is the same as a gents cane,and has a black aluminum scabbard.You get to have a touch of class,and only you know you also have protection! This is a decent cane though about 3 weeks later for the first time i pulled the sword out the blade was not sharp it did not even have a mirror finish on the blade and the blade is loose now I am waiting for BudK to send a postage paid shipping label to me so they can warranty it. hopefully they send it to me before it's too late. Editor's Note: Thank you for your comments. We have updated the review to reflect the appropriate spelling.